South Regent is like the favoured child compared to North Regent. South Regent has a truly wonderful building with windows so staff and users can see the action on the rink and lovely west facing windows so that the room warms after school when the kids come by. There are about 15 users and 2 staff skating. Almost no one has a helmet on. There are extra helmets available on top of the lockers. Staff explain that the helmets are not good quality and kids don't like wearing them "who knows where they have been", unless the kids are very little. But for shinny hockey the users are usually aged 12-18 and they refuse and staff respect their decision. Staff have not been given the city of Toronto helmets although the posters are up saying that helmets are on offer. Staff feel that there is some sense that Regent should not get fancy new helmets. The ice is good tonight although staff report that in the first month they did not get a scrape or flood more than once every other day. A permit is arriving tonight so everyone is happy that they will get ice maintenance. The lockers need to be fixed and the women's washroom is locked, women must use the men's which is propped open. 5:45pm Low 10, high 15 celsius. The rink is deserted. The changeroom door is locked but the gate in the boards is open allowing access to the ice. 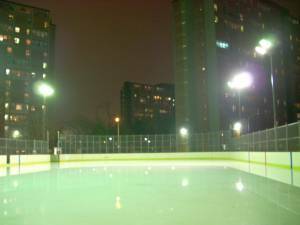 The rink surface is covered in water, but the ice underneath is solid.